Home » Pacline Articles » Safety in the workplace? What about garment conveyors? Safety in the workplace? What about garment conveyors? Safety in the workplace is more than a slogan. It’s a mantra sung by businesses all over the world in an effort to protect workers and prevent rising health insurance costs and sometimes fatal lawsuits. Accidents happen and seem to do so at the most inopportune times. Mishaps can pop up involving new and old equipment. With new equipment it’s often due to bad manufacturing and installation; with old equipment it’s a result of wear and tear that was not recognized and the lack of a stop-gap measure as a precaution to an accident. When there’s equipment failure by design. 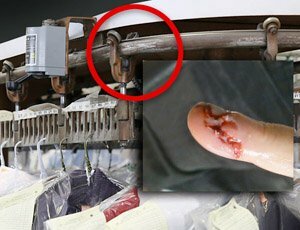 Let’s address these in order and in the context of garment handling conveyors. 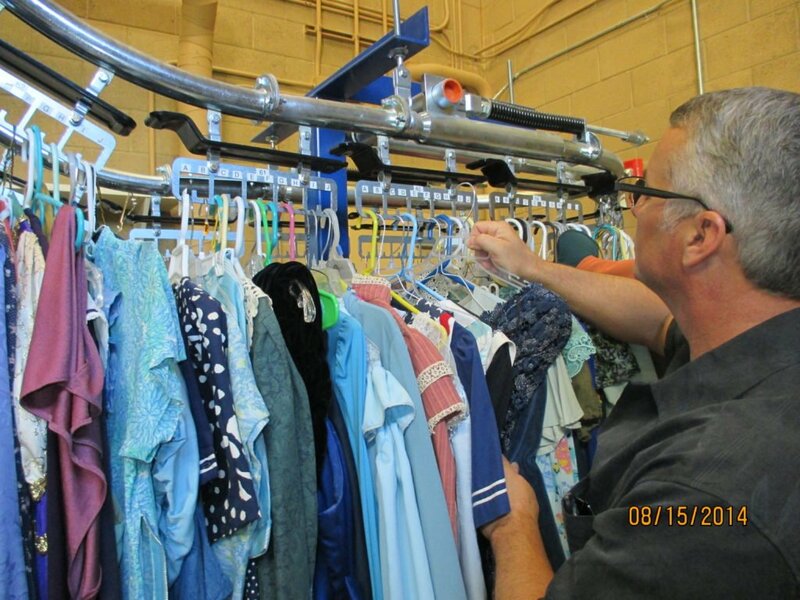 First, do your garment storage conveyors meet USA OSHA (Occupational Safety and Health Administration) regulations? Garment Conveyors? OSHA Regs? Really? Sure thing! On any machine where there are moving parts within reach of humans who interact with the machine, there must be safety precautions to prevent injury. Case in point: the dry cleaner garment/order storage conveyor, the inmate property storage system, and the hotel/casino employee uniform storage and retrieval conveyors. Slotted Racks: This is the part of the conveyor on which garments are hung. These are approximately 12 inches in length and typically have 5 – 10 spaces about 1 – 2 inches wide. These “racks” act as chain links and are hinged together with pins which hold the two-wheeled yokes. Track: Round tubing of varying thickness in the shape of the overall conveyor. If it’s a straight conveyor, the tubing starts at a front idler and proceeds around the front curve, to the far end and around the drive sprocket and then back to the front idler sprocket. Sprocket: A sprocket is a sprocket is a sprocket, teeth and all! It interacts with the chain and when the drive is engaged, the chain rotates around the track. The sprockets are supposed to keep the chain from jumping off the track, which can also be an on-going issue – we will address that in a future blog. So, where does OSHA come in? All conveyors from the major suppliers include track sections that, at some point, are just 72-inches (6-feet) max off the floor. For the yoke style conveyors, this is usually the idler sprocket end and if the system is flat or single-tier, the entire track will be just 6 feet above floor level. The safety issue here is that anyone around the conveyor could inadvertently grab the track to prevent a trip or fall, or to lean on it without thinking. If the chain is moving, the yokes and wheels will run across anything in its path including hands and fingers, causing considerable harm. As a precaution, there should be overhead conveyor safety guards wherever the track can be reached which is always at the front of the conveyor and along the sides and the drive area at the end when system is flat, single tier and single level. Yoke style conveyors have exposed wheels that create dangerous pinch pints. These overhead conveyor safety guards usually come at an additional cost of a minimum of $450-$500 USD for the initial install at the idler plus about $20 USD per foot for additional sections of safety guard. This is a costly solution but better than OSHA fines and penalties if caught without them or if harm comes to an employee or customer. The sprockets also need overhead conveyor safety guards when exposed which is usually on the inside of L-sections. There’s a cost to this as well – about $450-$500 USD minimum. The other major conveyor type used for garment handling systems are those with an “enclosed track” design. This can be seen with the PACLINE overhead conveyor systems. There are no yokes with wheels or sprockets. 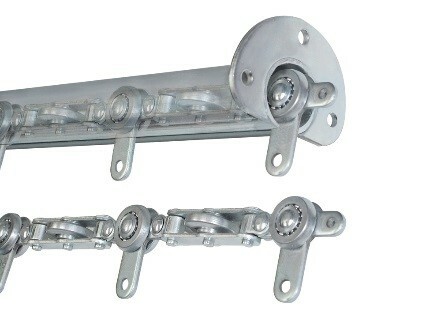 This type of conveyor is designed with the moving chain moving inside an enclosed track. This feature prevents the type of accident attributed to yokes and wheels. They do not use sprockets at all. The PACLINE conveyor design also allows for easy installation in overhead areas or small spaces to further minimize human contact with any moving parts to prevent possible mishaps. Operators are protected from contacting the moving chain with the PAC-LINE™ enclosed track system. Now, let’s look at safety issue #2. As mentioned way back in the third paragraph: equipment failure. Conveyors with chain, yokes and wheels have several break points. The chain—made of aluminum or steel—can break; snap in the middle of a link or at the hinge point. A yoke, because of stress, can crack and fall apart. Also, the wheels can wear out. In each case, the failure can happen at any moment while the drive is operating and the chain is moving around the system. On a flat or level conveyor system, and to a greater extent on a conveyor with an incline of 30, 40, or 60-degrees, when the chain breaks and dislodges itself from the track, disaster can strike. A break in the chain with the yoke-style conveyor can cause the entire chain to run free of the track resulting damage and possible injury to operators near the system. This is called “runaway chain” – the chain just keeps on moving, bunching up as it heads to the bottom of the incline. All along the way, garments on hangers fall to the wayside. Basically, you will experience a system in disarray because the chain had no place to go except off the track. It’s probably the most common failure of this type of conveyor. The PAC-LINE™ enclosed-track design prevents the potential dangers should a chain break occur. With an enclosed-track conveyor system such as the PAC-LINETM, should a breakage occur the chain will bunch up inside the round track, not outside, preventing operator accidents and further damage to other parts of the system. It’s really a no-brainer of an idea: contain the mishap to a small area, reduce possible accidents, and limit costly damage. Is there an additional cost to this type of enclosed-track system to prevent runaway chain? Usually not, but don’t take our word for it. Take their quote for it. Ask PACLINE to quote a system that will prevent accidents such as fingers in yokes and wheels and runaway chain. 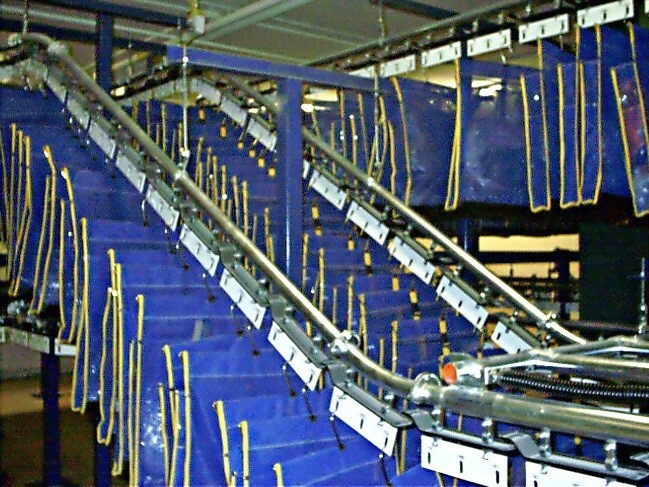 If you want to know more about PACLINE, take a look at the garment conveyors section their website: https://www.pacline.com/products/garment-conveyor/.